For the similarly-named Windows CE-based operating system, see Windows Mobile. Windows 10 Mobile is a mobile operating system developed by Microsoft, released in 2015. Although it is the successor of Windows Phone 8.1, it is an edition of Windows 10 running on devices that have less than a 9-inch screen, as a result of Microsoft's plans to unify Windows families across multiple device classes. Mainstream support ends on December 10, 2019; 7 months' time (2019-12-10). Devices need to install the latest update and be within the OEM support period to be eligible for mainstream support; the latest update, however, may not be compatible with all devices. Windows 10 Mobile aims to provide greater consistency with its counterpart for personal computers, including more extensive synchronization of content, a new universal application platform that allows one app to run on multiple Windows 10 devices such as PCs, mobile devices and Xbox, as well as the capability, on supported hardware, to connect devices to an external display and use a "PC-like" interface with mouse and keyboard input support. Microsoft has built tools for developers to easily port some iOS apps with minimal modifications. Windows Phone 8.1 smartphones are eligible for upgrade to Windows 10 Mobile, pursuant to manufacturer and carrier support. Some features vary depending on hardware compatibility. Windows 10 Mobile was designed for use on smartphones and phablets running on 32-bit ARM processor architectures. Windows 10 Mobile entered public beta for selected Lumia brand smartphones on February 12, 2015. The first Lumia smartphones powered by Windows 10 Mobile were released on November 20, 2015 while eligible Windows Phone devices began receiving updates to Windows 10 Mobile on March 17, 2016, pursuant to manufacturer and carrier support. The platform never achieved any significant degree of popularity or market share in comparison to Android or iOS. By 2017, Microsoft had already begun to downplay Windows 10 Mobile, having discontinued active development (beyond maintenance releases) due to a lack of user and developer interest in the platform, and focusing more on serving incumbent mobile operating systems as part of its software and services strategy. Windows 10 Mobile will be deemed end-of-life on December 10, 2019. Microsoft had already begun the process of unifying the Windows platform across device classes in 2012; Windows Phone 8 dropped the Windows CE-based architecture of its predecessor, Windows Phone 7, for a platform built upon the NT kernel that shared much of the same architecture with its PC counterpart Windows 8 including file system (NTFS), networking stack, security elements, graphics engine (DirectX), device driver framework and hardware abstraction layer. At Build 2014, Microsoft also unveiled the concept of Universal Windows Apps. With the addition of Windows Runtime support to these platforms, apps created for Windows 8.1 could now be ported to Windows Phone 8.1 and Xbox One while sharing a common codebase with their PC counterparts. User data and licenses for an app could also be shared between multiple platforms. In July 2014, Microsoft's then-new CEO Satya Nadella explained that the company was planning to "streamline the next version of Windows from three operating systems into one single converged operating system for screens of all sizes," unifying Windows, Windows Phone, and Windows Embedded around a common architecture and a unified application ecosystem. However, Nadella stated that these internal changes would not have any effect on how the operating systems are marketed and sold. On September 30, 2014, Microsoft unveiled Windows 10; Terry Myerson explained that Windows 10 would be Microsoft's "most comprehensive platform ever," promoting plans to provide a "unified" platform for desktop computers, laptops, tablets, smartphones, and all-in-one devices. Windows 10 on phones was publicly unveiled during the Windows 10: The Next Chapter press event on January 21, 2015; unlike previous Windows Phone versions, it would also expand the platform's focus to small, ARM-based tablets. Microsoft's previous attempt at an operating system for ARM-based tablets, Windows RT (which was based upon the PC version of Windows 8) was commercially unsuccessful. During the 2015 Build keynote, Microsoft announced the middleware toolkit "Islandwood", later known as Windows Bridge for iOS, which provides a toolchain that can assist developers in porting Objective-C software (primarily iOS projects) to build as Universal Windows Apps. An early build of Windows Bridge for iOS was released as open source software under the MIT License on August 6, 2015. Visual Studio 2015 can also convert Xcode projects into Visual Studio projects. Microsoft also announced plans for a toolkit codenamed "Centennial", which would allow desktop Windows software using Win32 APIs to be ported to Windows 10 Mobile. At Build, Microsoft had also announced an Android runtime environment for Windows 10 Mobile known as "Astoria", which would allow Android apps to run in an emulated environment with minimal changes, and have access to Microsoft platform APIs such as Bing Maps and Xbox Live as nearly drop-in replacements for equivalent Google Mobile Services. Google Mobile Services and certain core APIs would not be available, and apps with "deep integration into background tasks" were said to poorly support the environment. On February 25, 2016, after already having delayed it in November 2015, Microsoft announced that "Astoria" would be shelved. Microsoft argued that an Android emulator was ultimately redundant to the native, Objective-C toolchain, because iOS was already a primary target in multi-platform mobile development. The company also encouraged use of products from Xamarin (which they had acquired the previous day) for multi-platform app development using C# programming language instead. The Windows Subsystem for Linux (that isn't available in the Mobile version) was developed from Project Astoria. In accordance with Microsoft's branding strategy, this operating system is branded primarily as an edition of Windows 10, rather than "Windows Phone 10". Microsoft had begun to phase out specific references to the Windows Phone brand in its advertising in mid-2014, but critics have still considered the operating system to be an iteration and continuation of Windows Phone due to its lineage and similar overall functionality. Microsoft referred to the OS as "Windows 10 for phones and small tablets" during its unveiling, leaked screenshots from a Technical Preview build identified the operating system as "Windows 10 Mobile" and the technical preview was officially called the "Windows 10 Technical Preview for phones". Internally, the Microsoft Edge user agent on Windows 10 Mobile still contains a reference to "Windows Phone 10". On May 13, 2015, Microsoft officially confirmed the platform would be known as Windows 10 Mobile. A major aspect of Windows 10 Mobile is a focus on harmonizing user experiences and functionality between different classes of devices—specifically, devices running the PC-oriented version of Windows 10. Under the Universal Windows Platform concept, Windows Runtime apps for Windows 10 on PC can be ported to other platforms in the Windows 10 family with nearly the same codebase, but with adaptations for specific device classes. Windows 10 Mobile also shares user interface elements with its PC counterpart, such as the updated Action Center and settings menu. During its initial unveiling, Microsoft presented several examples of Windows apps that would have similar functionality and user interfaces between Windows 10 on desktops and mobile devices, including updated Photos and Maps apps, and new Microsoft Office apps. Although marketed as a converged platform, and as with Windows Phone 8, using a Windows NT-based kernel, Windows 10 Mobile still cannot run Win32 desktop applications, but is compatible with software designed for Windows Phone 8. Notifications can be synced between devices; dismissing a notification on, for example, a laptop, will also dismiss it from a phone. Certain types of notifications now allow inline replies. The start screen now has the option to display wallpapers as a background of the screen behind translucent tiles, rather than within the tiles. The messaging app adds support for internet-based Skype messaging alongside SMS, similarly to iMessage, and can synchronize these conversations with other devices. The camera app has been updated to match the "Lumia Camera" app previously exclusive to Lumia products, and a new Photos app aggregates content from local storage and OneDrive, and can perform automatic enhancements to photos. The on-screen keyboard now contains a virtual pointing stick for manipulating the text editing cursor, a dedicated voice input button, and can be shifted towards the left or right of the screen to improve one-handed usability on larger devices. Windows 10 Mobile supports "Continuum", a feature that allows supported devices to connect to an external display, and scale its user interface and apps into a "PC-like" desktop interface with support for mouse and keyboard input over USB or Bluetooth. Devices can connect directly to external displays wirelessly using Miracast, via USB-C, or via docking station accessories with USB ports, as well as HDMI and DisplayPort outputs. A new iteration of the Office Mobile suite, Office for Windows 10, is also bundled. Based upon the Android and iOS versions of Office Mobile, they introduce a new user interface with a variation of the ribbon toolbar used by the desktop version, and a new mobile version of Outlook. Outlook utilizes the same rendering engine as the Windows desktop version of Microsoft Word. Microsoft Edge replaces Internet Explorer Mobile as the default web browser. Windows 10 Mobile's first-party launch devices—the Lumia 950, Lumia 950 XL, and Lumia 550—were released in November 2015 being the first phones to ship with Windows 10 Mobile. Monthly updates to the OS software are being released to address bugs and security issues. These updates are distributed to all Windows 10 Mobile devices and do not require the intervention of a user's wireless carrier in order to authorize their distribution. Firmware upgrades will still require authorization by the user's carrier. The Windows Insider program, adopted to provide a public beta for the PC version of Windows 10, is used to provide a public beta version of Windows 10 Mobile for selected devices. A build released on April 10, 2015 was to support most second and third generation Lumia products, but the Lumia 930, Lumia Icon, and Lumia 640 XL did not receive the update due to scaling bugs, and delivery was suspended as a whole due to backup and restore issues on some models. An update to the Windows Phone Recovery Tool resolved these concerns, and delivery of Windows 10 updates was restored to the 520 with build 10052, and to the 640 with build 10080. Build number 10136 was released on June 16, 2015, with a "migration bug" that required that existing devices on build 10080 be reverted to Windows Phone 8.1 using the Recovery Tool before the installation of 10136 could proceed. This migration bug was fixed a week later with the release of build 10149. Mobile builds of the Redstone branch till 14322 were halted for the device Lumia 635 (1 GB RAM) due to bugs. Some Windows Phone 8.1 smartphones can be upgraded to Windows 10, pursuant to hardware compatibility, manufacturer support, and carrier support. Not all phones can receive the update nor support all of its features. Microsoft originally stated that stable upgrades for Windows Phone 8.1 devices would be released in December 2015; however, the release was ultimately delayed to March 17, 2016. Among first-party devices, only the Lumia 430, 435, 532, 535, 540, 635 (1 GB RAM), 640, 640 XL, 735, 830, 929, 930 and 1520 are supported. The only third-party devices supported are the BLU Products Win HD w510u and Win HD LTE x150q, and the MCJ Madosma Q501. Windows 10 Mobile does not officially support any HTC devices (HTC One M8 for Windows, HTC Windows Phone 8X, HTC Windows Phone 8S), although the HTC One M8 for Windows could be upgraded to the public release version of Windows 10 Mobile through the Windows Insider program. While Microsoft stated that the Nokia Lumia Icon may be upgraded at a later date, the company stated that there will not be a second wave of officially supported devices. Microsoft also removed statements which promoted the BLU Win JR LTE as being compatible with Windows 10. As with Windows Phone, Windows 10 Mobile supports ARM system-on-chips from Qualcomm's Snapdragon line. In March 2015, Ars Technica reported that the operating system will also introduce support for IA-32 system-on-chips from Intel and AMD, including Intel's Atom x3 and Cherry Trail Atom x5 and x7, and AMD's Carrizo. However, as of November 2016, it did not happen. Minimum specifications for Windows 10 Mobile devices are similar to those of Windows Phone 8, with a minimum screen resolution of 800×480 (854×480 if software buttons are in use), 1 GB of RAM and 8 GB of internal storage. Owing to hardware advancements and the operating system's support for tablets, screen resolutions can now reach as high as QSXGA resolution (2560×2048) and further, as opposed to the 1080p cap of Windows Phone 8. The minimum amount of RAM required is dictated by the screen's resolution; screens with a resolution 800×480 or 960×540 and higher require 1 GB, 1920×1080 (FHD) or 1440×900 and higher require 2 GB, and 2560×1440 and higher require 3 GB. Microsoft unveiled flagship Microsoft Lumia smartphones during a media event on October 6, 2015, including Lumia 950, Lumia 950 XL, and the low-end Lumia 550. Microsoft announced Windows 10 Mobile during their January 21, 2015 event "The Next Chapter". The first Windows 10 Mobile build was rolled out on February 12, 2015 as part of the Windows Insider Program to a subset of mobile devices running Windows Phone 8 and 8.1. As with the desktop editions of Windows 10, this initial release was codenamed "Threshold", it was part of both the "Threshold 1" and "Threshold 2" development cycles. Windows 10 Mobile launched with the Microsoft Lumia 550, 950 and 950 XL. The rollout for Windows Phone 8.1 devices started March 17, 2016. On February 19, 2016, Microsoft restarted the rollout of full builds for the first feature update, officially known as the "Anniversary Update" or "Version 1607", codenamed "Redstone 1". Like the start of the previous wave, the first builds were not available to all devices that were included in the Windows Insider Program. The Creators Update (named after the equivalent update to Windows 10 for PC), also known as Redstone 2, was first previewed on the Insider branch on August 17, 2016. and began deployment on April 25, 2017. It features mainly minor feature additions, including an e-book reader within Edge, the ability to turn off the phone screen when using Continuum mode on an external display, SMS support in Skype, SD card encryption, and other changes. Despite the platform's synergy with Windows 10 for PCs, some of its features (such as Night Light and Paint 3D) were excluded. Around the time that the Creators Update was finalized, Windows Insider users began to be issued updates on a branch known as feature2. Microsoft stated that there were no plans to move Windows 10 Mobile to be in sync with the other Windows 10-platforms just yet; media outlets considered this decision to be a sign that Microsoft was beginning to wind down active development of Windows 10 Mobile beyond maintenance releases, as development was no longer directly in sync with the PC version. indicates a phone that is incompatible with the Fall Creators Update. In early-June 2017, a private build, briefly deployed by accident by Microsoft, revealed work on an updated interface for Windows 10 Mobile known as "CShell" ("composable shell"), an implementation of the Windows shell across device classes using a modular system. The build featured a Start screen, Action Center, and Continuum desktop interface that were nearly identical in functionality and appearance to their equivalents on Windows 10 for PC. However, this iteration of the operating system was no longer backwards compatible with Windows Phone Silverlight apps. Reception of Windows 10 Mobile was mixed. In its review of the Lumia 950 XL, The Verge felt that the platform was "buggy and unfinished", and that its user interface was inconsistent in operation and felt more like Android mixed with few of the distinct design elements that were hallmarks of Windows Phone. It was noted that the OS still retained much of the performance of Windows Phone 8, and that Microsoft had made efforts to create synergies with the PC version of Windows 10 via its universal apps concept. Continuum was regarded as potentially being a signature feature over time, but that it was merely a "parlor trick" in its launch state due to a lack of support for desktop-oriented interfaces among third-party software. TechRadar felt that the lack of apps was the "biggest let-down on Windows Phone and Windows 10 Mobile alike." After many user complaints, Microsoft started allowing users to downgrade from Windows 10 to Windows Phone 8.1. On October 8, 2017, Microsoft executive Joe Belfiore revealed that the company would no longer actively develop new features or hardware for Windows phones, citing its low market share, and the resultant lack of third-party software for the platform. Microsoft had largely abandoned its mobile business, having laid off the majority of Microsoft Mobile employees in 2016, sold a number of intellectual property and manufacturing assets (including, in particular, the Nokia feature phone business) to HMD Global and Foxconn (which intended to begin producing Android-based phones under the Nokia brand). and having focused software efforts on providing apps and services compatible with Android and iOS instead. Development of Windows 10 Mobile would be limited to maintenance releases and patches. By December 2018, Statcounter had reported Windows 10 Mobile's market share to be 0.33%. In January 2019, it was officially announced that Windows 10 Mobile will reach end of life on December 10, 2019, after which no further security updates will be released, and online services tied to the OS (such as device backup) will begin to be phased out. ^ Dolcourt, Jessica (October 6, 2015). "Microsoft Lumia 950 coming in November with Windows 10, 5.2-inch screen, starts at $549 (hands-on)". CNET. CBS Interactive. ^ "April 9, 2019—KB4495357 Update for Windows 10 Mobile (OS Build 15254.562)". Microsoft.com. Retrieved April 10, 2019. ^ a b Aul, Gabriel (April 14, 2016). "Announcing Windows 10 Insider Preview Build 14322". Windows Blog. ^ a b c d e "Minimum hardware requirements". Microsoft Hardware Dev Centr. ^ "Microsoft Support Lifecycle: Windows 10 Mobile". Support. Microsoft. Retrieved January 25, 2018. ^ a b Viswav, Pradeep (May 13, 2015). "It's Official: The Next Version Of Windows Phone OS Will Be Called Windows 10 Mobile". Windows Mobile PowerUser. Mobile First Network. ^ "Microsoft will unify Windows, Windows Phone, and Xbox into 'one converged operating system'". ExtremeTech. Condé Nast. Retrieved October 31, 2015. ^ a b Bright, Peter (January 24, 2015). "Every Windows Phone 8 phone will get Windows 10, except the ones that won't". Ars Technica. Condé Nast. ^ "Yes, Windows 10 is Coming to Low-End Windows Phones". thurrot.com. Self-published. February 9, 2015. Retrieved February 11, 2015. ^ "Windows 10 won't launch on phones this summer". The Verge. Vox Media. Retrieved July 2, 2015. ^ "Windows Phone 7 based on a hybrid Windows CE 6 / Compact 7 kernel?". Engadget. AOL. Retrieved February 9, 2015. ^ "Windows Phone 8 and Windows 8 share lots of code, NT kernel". Engadget. AOL. Retrieved February 9, 2015. ^ "Microsoft's Windows Phone 8 finally gets a 'real' Windows core". ZDNet. CBS Interactive. Retrieved February 9, 2015. ^ a b "Microsoft's universal Windows apps run on tablets, phones, Xbox, and PCs". PC World. IDG. Retrieved April 5, 2014. ^ "Nadella Raises Eyebrows With Plans to 'Streamline' Windows". PC Magazine. Retrieved October 1, 2014. ^ "Why did Microsoft choose Windows 10 instead of Windows 9?". Techradar. Retrieved September 30, 2014. ^ Oremus, Will (September 30, 2014). "Windows 8 Was So Bad That Microsoft Is Skipping Windows 9". Slate. Retrieved September 30, 2014. ^ a b "Microsoft has 'tailored' version of Windows 10 for phones, tablets". CNET. CBS Interactive. Retrieved January 23, 2015. ^ "Microsoft confirms: Android-on-Windows Astoria tech is gone". Ars Technica. Retrieved February 25, 2016. ^ a b c "Microsoft releases iOS-to-Windows app maker Windows Bridge to open source". PC World. IDG. Retrieved August 6, 2015. ^ "Windows Bridge for iOS". MSDN. Microsoft. Retrieved January 16, 2018. ^ a b "Microsoft confirms: Android-on-Windows Astoria tech is gone". Ars Technica. Conde Nast. Retrieved February 25, 2016. ^ a b "Microsoft might not bring Android apps to Windows after all". The Verge. Vox Media. Retrieved November 16, 2015. ^ "How will Android support work in Windows 10 for Phones?". TechRadar Pro. Retrieved May 22, 2015. ^ Collins, Katie (November 16, 2015). "Microsoft presses pause on tool for porting Android apps to Windows 10". CNET. CBS Interactive. ^ "An Update on the Developer Opportunity and Windows 10". Building Apps for Windows blog. Microsoft. Retrieved February 25, 2016. ^ Bright, Peter (April 6, 2016). "Why Microsoft needed to make Windows run Linux software". Ars Technica. Condé Nast. 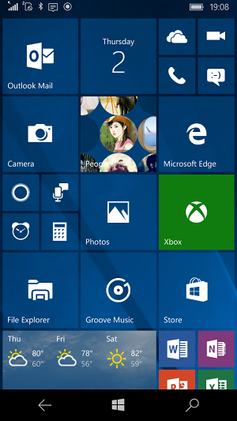 ^ a b "Our first look at Windows 10 on phones, and Universal Apps for touchscreens". Ars Technica. Condé Nast. Retrieved January 23, 2015. ^ a b c "Leaked images of Windows 10 for phones show us what to expect". Ars Technica. Retrieved February 7, 2015. ^ a b Savov, Vlad. "Windows 10 makes its phone debut". The Verge. Vox Media. Retrieved January 21, 2015. ^ "Microsoft is killing the Nokia and Windows Phone brands". The Verge. Vox Media. Retrieved January 30, 2015. ^ "Windows Phone 10 to be called just Windows 10". GSMArena. Retrieved January 21, 2015. ^ Surur, Suril (February 13, 2015). "Technical Preview on any WP8 handset with a microSD card slot". WMPowerUser. ^ "User-agent string changes". microsoft.com. Microsoft. Retrieved October 1, 2015. ^ "Introducing Windows 10 Editions". blogs.windows.com. Microsoft. Retrieved May 13, 2015. ^ a b "Microsoft previews universal apps for Windows 10 PCs, tablets, and phones". The Verge. Vox Media. Retrieved February 7, 2015. ^ "Microsoft Windows 10 Event January 2015 (Full)". Microsoft. January 21, 2015. Retrieved February 8, 2015. ^ "Microsoft updates Windows on phones without carriers screwing it up". Ars Technica. Retrieved December 9, 2015. ^ "Microsoft finally shows off Windows 10 on smartphones and small tablets". Engadget. AOL. Retrieved January 22, 2015. ^ a b c d "This is Windows 10 for phones". The Verge. Vox Media. Retrieved January 22, 2015. ^ a b "Microsoft reneges on Windows 10 upgrades for all current Lumia phones". PC World. IDG. Retrieved January 23, 2015. ^ "Your Windows 10 phone can turn into a full PC". The Verge. Vox Media. Retrieved April 29, 2015. ^ "Continuing With Microsoft's Continuum: Docking Options". Tom's Hardware Guide. Retrieved December 1, 2015. ^ "Microsoft previews Office for Windows 10 phones and small tablets". The Verge. Vox Media. Retrieved February 7, 2015. ^ a b "Microsoft's new Lumia 550 announced at $139". The Verge. Vox Media. Retrieved October 6, 2015. ^ a b "Windows 10 will start rolling out to phones in December". The Verge. Vox Media. October 6, 2015. Retrieved October 7, 2015. ^ "Microsoft Can Releases Windows 10 Updates Without Carrier Authorization". UberGizmo. Retrieved December 28, 2015. ^ a b c "Joe Belfiore: Windows 10 update for 512 MB phones in the works". GSMArena. Retrieved February 9, 2015. ^ Rubino, Daniel (April 8, 2015). "Next build for Windows 10 for Phone due this Friday, Lumia 930 and Icon excluded". Windows Central. Mobile Nations. Retrieved April 9, 2015. ^ Popa, Bogdan (April 16, 2015). "Microsoft Pulls Windows 10 Build 10051 for Lumia 520, 525, and 526". Softpedia. SoftNews. Retrieved April 30, 2015. ^ "Download The New Windows Phone Recovery Tool From Microsoft". WMPoweruser. Mobile First Network. February 12, 2015. Retrieved April 30, 2015. ^ Thurrott, Paul (June 16, 2015). "Microsoft Releases Windows 10 Mobile Build 10136 for Phones". Thurrott.com. Retrieved June 16, 2015. ^ Rubino, Daniel (June 25, 2015). "Insiders on Windows 10 Mobile build 10080 can now directly update to 10149". Windows Central. Mobile Nations. Retrieved June 25, 2015. ^ "Microsoft Delays Windows 10 Mobile For Older Smartphones". InformationWeek. Retrieved December 20, 2015. ^ "Windows 10 Mobile launches for existing handsets". The Verge. Vox Media. March 17, 2016. Retrieved March 17, 2016. ^ "Microsoft breaks its Windows 10 Mobile upgrade promise". The Verge. Retrieved March 20, 2016. ^ "HTC Windows Phone 8X won't receive Windows 10 Mobile update". GSMArena. Retrieved January 12, 2016. ^ Newman, Jared (March 18, 2016). "No Windows 10 Mobile upgrade for Windows phones with 512MB RAM, HTC One M8". PCWorld. IDG. Retrieved March 20, 2016. ^ "Windows 10 Mobile Won't Be Released to 512 MB Windows Phones". Softpedia. SoftNews NET SRL. March 18, 2016. Retrieved March 18, 2016. ^ "Microsoft "Blames" Users for Lumia 1020, 1320 Not Getting Windows 10 Mobile". Softpedia. Retrieved March 20, 2016. ^ "Microsoft has a new tool to bring your Windows phones up to date". MSpoweruser. Retrieved October 22, 2017. ^ "Windows 10 phones to get bigger, smaller, faster, and maybe even x86ier". Ars Technica. Retrieved March 21, 2015. ^ Foley, Mary Jo (November 8, 2016). "Could and should Microsoft enable Windows 10 Mobile on Intel?". ZDNet. CBS Interactive. ^ Popa, Bogdan (August 13, 2016). "Windows 10 Mobile Far from Reaching RTM, Microsoft Confirms". Softpedia. ^ Popa, Bogdan (August 12, 2015). "Windows 10 Mobile Build 10512 Screenshots Leaked". Softpedia. ^ Fortin, Michael (March 17, 2016). "Upgrading existing Windows Phone 8.1 devices to Windows 10 Mobile". Windows Experience Blog. Microsoft. ^ Bright, Peter. "Windows 10 Anniversary Update coming August 2 for 350 million Windows 10 users". Ars Technica. Conde Nast Digital. Retrieved June 30, 2016. ^ Thorp-Lancaster, Dan (February 19, 2016). "Here's what's new in Windows 10 Mobile build 14267". Windows Central. Mobile Nation. ^ Devine, Richard (December 8, 2015). "Hands-on with the Windows 10 Mobile powered Xiaomi Mi4". Windows Central. Mobile Nations. ^ Callaham, John (August 17, 2016). "Windows 10 PC and Mobile preview build 14905 rolling out for Fast ring Insiders [Update 2]". Windows Central. ^ "Microsoft starts rolling out Windows 10 Mobile Creators Update release". ZDNet. CBS Interactive. Retrieved June 15, 2017. ^ "Windows 10 Mobile Creators Update review: The future is increasingly uncertain". PC World. IDG. Retrieved June 15, 2017. ^ "Microsoft: Windows Phones to Stick with Feature2, No Redstone 3 Upgrade Planned". Softpedia. Retrieved June 15, 2017. ^ "Microsoft has released two new Windows 10 test builds -- 16179 for PCs and 15205 for phones. Both are still more about fixes than brand-new features". ZDNet. CBS Interactive. Retrieved June 15, 2017. ^ "Only a small number of Windows phones will get the Windows 10 Creators Update". The Verge. April 6, 2017. Retrieved April 24, 2017. ^ Allison, Michael (October 18, 2017). "The Lumia 640 and 640 XL can't handle Microsoft's feature-packed Windows 10 Fall Creators Update - MSPoweruser". MSPoweruser. Retrieved July 20, 2018. ^ "Microsoft's Windows 10 'CShell' adaptable UI in images and video (exclusive)". Windows Central. Retrieved June 15, 2017. ^ "Microsoft's CShell: What is it and how does it fit into Windows 10's future?". ZDNet. Retrieved June 15, 2017. ^ "Silverlight compatibility layer axed from future Windows 10 Mobile... Probably". All About Windows Phone. Retrieved August 13, 2017. ^ Warren, Tom (2015-12-18). "Microsoft Lumia 950 XL review". The Verge. Retrieved 2019-01-23. ^ Peckham, James. "Windows 10 Mobile review". TechRadar. Retrieved 2019-01-23. ^ "Microsoft lays off hundreds as it guts its phone business". The Verge. Retrieved October 9, 2017. ^ Shilov, Anton. "HMD Closes Nokia Brand and Patents Deal with Microsoft, Smartphones Due in 2017". Anandtech. Retrieved 2019-01-23. ^ "Microsoft finally admits Windows Phone is dead". The Verge. Retrieved October 9, 2017. ^ "Microsoft exec says Windows 10 Mobile is no longer a 'focus'". Engadget. Retrieved October 9, 2017. ^ Reilly, Claire (October 8, 2017). "Windows 10 Mobile gets its final death sentence". CNET. Retrieved October 9, 2017. ^ "Microsoft sets end-of-life date for Windows 10 Mobile". IT PRO. Retrieved 2019-01-23. ^ Warren, Tom (2019-01-18). "Microsoft to end Windows 10 Mobile updates and support in December". The Verge. Retrieved 2019-01-23. ^ Warren, Tom (2018-10-03). "Microsoft is embracing Android as the mobile version of Windows". The Verge. Retrieved 2019-01-23.